PE stand for Portable Executable that is native file format for Win32. Portable Executable file format is universal across all win32 platform. All Win32 executables like Control Panel Applets (.CPL ), 32bit DLLs, COM files, .NET executables and also NT’s kernel mode drivers. Note that VxDs(virtual device drivers) and 16 bit DLLs not use PE file format. The general outlook of PE file is like shown in figure. PE file mainly have DOS Header, PE Header & Sections. Let have a look on every part. DOS MZ header: PE files starts with DOS header of 64 bytes. Its structure (IMAGE_DOS_HEADER) is defined in winnt.h or windows.inc that composes of 19 members but only two that is magic and Ifnew are most important. Ifnew-indicates offset of PE header and PE signature at start of PE header. DOS Stub: When OS is not able to recognize the PE file then it will execute the EXE (DOS stub). So it is like valid EXE. Signature: is 32 bit (DWORD) containing the value 50h, 45h, 00h, 00h (“PE” followed by two terminating zeroes). FileHeader: Next 20 bytes of PE file. It has various information about physical layout (IMAGE_FILE_HEADER) & properties of file e.g. number of sections. OptionalHeader: next 224 bytes and contains info about the logical layout (IMAGE_OPTIONAL_HEADERS) inside the PE file e.g. AddressOfEntryPoint, ImageBase, SectionAlignment, FileAlignment, SizeOfImage, SizeOfHeaders & DataDirectory(16 IMAGE_DATA_DIRECTORY array structure at last 128 bytes that relate import address table). Import data: .idata-> names and variables of imported functions as well as Import Descriptor and IAT. When we run PE file, First of all PE loader examines the DOS MZ header for the offset of the PE header. If not found then execute DOS stub otherwise skips to the PE header. Then PE loader checks the validity of PE header. If ok, goes to the end of PE header. Using file mapping PE header reads information about the sections and maps those sections into memory. It also gives each section the attributes as specified in the section table. After PE file is mapped into memory, the PE loader concerns itself with the logical parts of the PE file, such as the import table. Using same code we can retrieve section structure, its content of attributes etc. Similarly we can retrieve DATA_DIRECTORIES. We can change the address of OEP(Original Entry Point). This will help when we manually unpacking a packed file where change in Address_Of_Entry_Point to OEP is required. We can inject code (may be malicious) into the executable at the entry point. So that when application run our code will execute. For injection we use set_bytes_at_offset() method. It returns true or false depending on the success of the operation. set_bytes_at_offset takes two parameters offset and data. Offset that point to the destination where the data is to be copied. Data contains the our code that to be copy (str). There are many GUI tools like Resource Hacker, PE Explorer, PE browse, dependency walker, PEid, PEviewfor analyzing PE file. We can differentiate between EXE and DLL by seeing at the Characteristics attribute of File_Header. 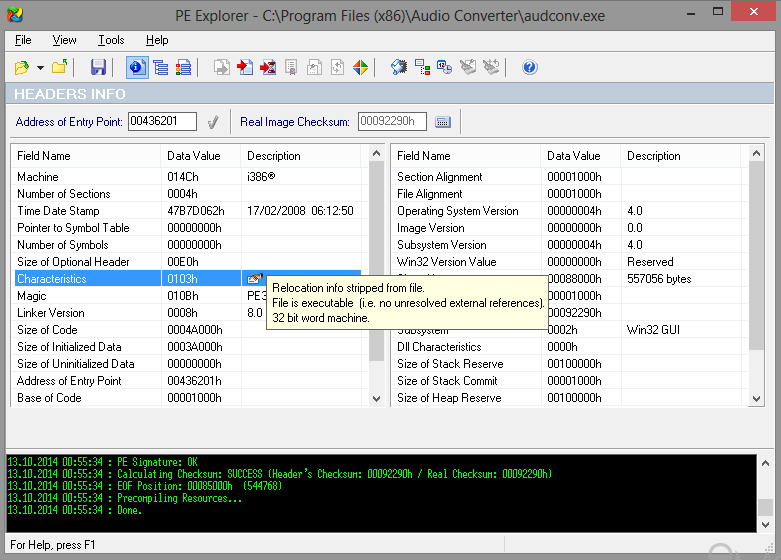 It is easy to load the application into PE Explorer tool and see the Characteristic field that tell it is DLL or EXE.